I wouldn’t call myself a social media maven. I have a personal Facebook account, a Facebook author page, and I putter about on Twitter. I post on most days but when it comes time to boost my writing career sometimes I’m at a loss. A big part of the problem is that I feel like I never know what is going to click with my online readers. Often, even when I put a great deal of effort into my posts . . . nothing. I only get a handful of likes or responses. It can really be discouraging. I was in the middle of feeling sorry for myself one day when I got a message from Susan Ahearn, one of my former students. 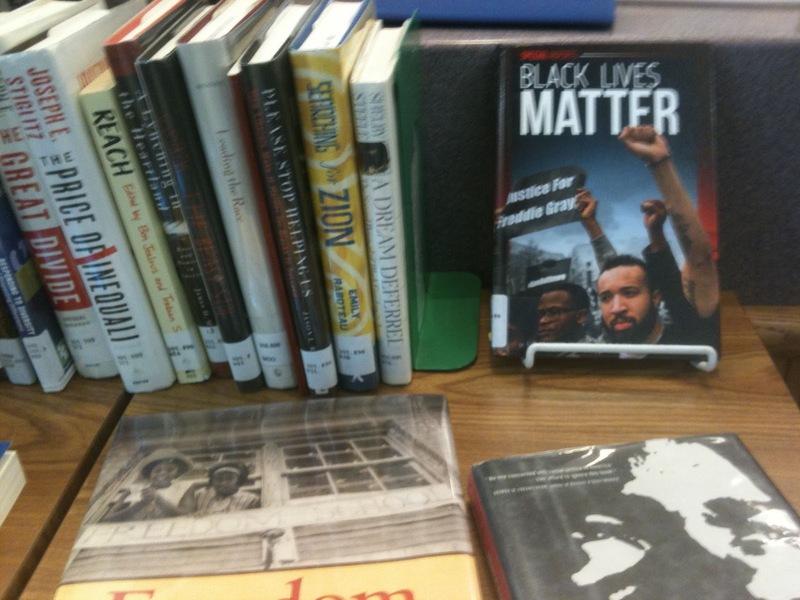 She had sighted my book, Black Lives Matter, at her local library. It was part of a display at the checkout desk and she wanted me to see it. Her photo made my day! This made me think. What about other writers? I bet they’d like to know where their books have been sighted and who is reading them. I decided that the rest of my tweets for the week would focus on sightings, found books, and my local library. 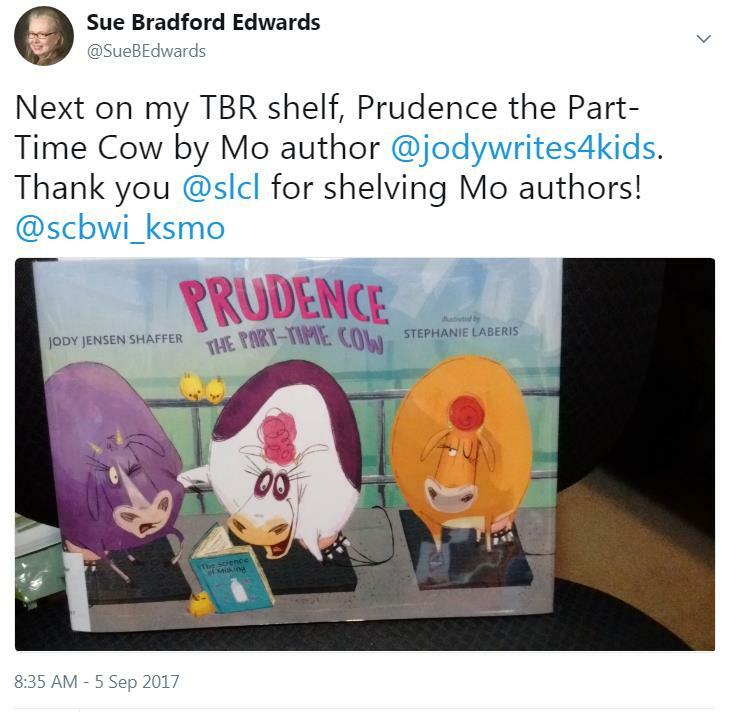 First I tweeted about Prudence the Part Time Cow by fellow Missouri author Jody Jensen Shaffer. 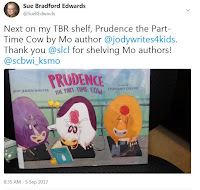 I tagged Jody, my library system, and our region of the Society of Children’s Book Writers and Illustrators. The tweet received 155 interactions in a day. Not bad. Not bad at all. 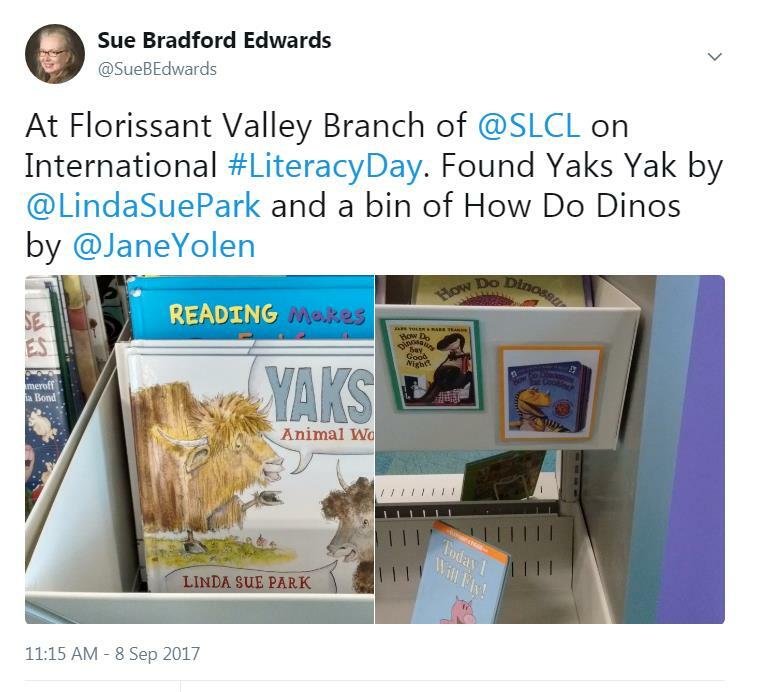 Later in the week, I tweeted about International Literacy Day. I explained that I planned to celebrate by going to my library. I included a photo of a boy sitting on a stack of books reading and tagged the library system and #LiteracyDay. This time, I got 655 interactions in a day including two retweets. Why such a great response? My thought is that #LiteracyDay had broad appeal. 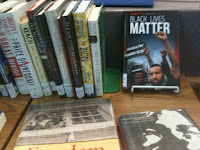 A second tweet on this topic came after my actual trip to the library. 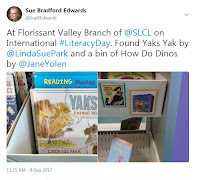 In this tweet, I focused on sighting books by Linda Sue Park and a whole bin featuring Jane Yolen’s How Do Dinosaurs books. This tweet included photos of the books. I again tagged my library, #LiteracyDay, and both authors. This time tweet got 565 interactions in one day. When you post on social media, it is easy to get caught up in your own work. Sure, your friends care, your family cares, and your fellow writers care. If you can find a way to go beyond your work and your readers by holding up other writers and reading in general, you too might pull in more interactions. Social media is a lot more fun when you know your words are having an impact. Great advice, Sue! I also flounder when it comes to my social media accounts and have noticed that my "toot your own horn" posts don't always get that much attention. I like the idea of lifting up other writers as a way of engagement. Sue--This was a wonderful post, and gave me an idea for a future post. It's a great idea to hold our writer friends up for the rest of the world to see. We never get the recognition we deserve, and what a pleasant surprise that is for writers to see where you found their books. Thanks for this. It's a brilliant idea. I struggle with the same social media issues, but do try to keep in mind that offering something to your readers (and other writers) is a great goal to keep in mind, and I love this idea! Thanks for sharing. It sounds like we will have quite a round of "book sightings" or something similar posted. Looking forward to seeing them!